“We created the same opportunities against McGill, but we didn’t have that extra fire,” said Julie Chu, the team’s head coach. The Stingers sure did show that “extra-fire” against Carleton on Sunday. The Stingers took a comfortable lead in the first period, which ended with them leading three to nothing. After 10 minutes of play, Audrey Belzile, the team’s leading scorer assisted Stéphanie Lalancette as she slipped the puck to the back of the net from behind the goal line. Just two minutes later, Sophie Gagnon scored off of a heavy slap shot from the blue line that ended in the top right corner. Belzile added another goal to her collection before the end of the period. 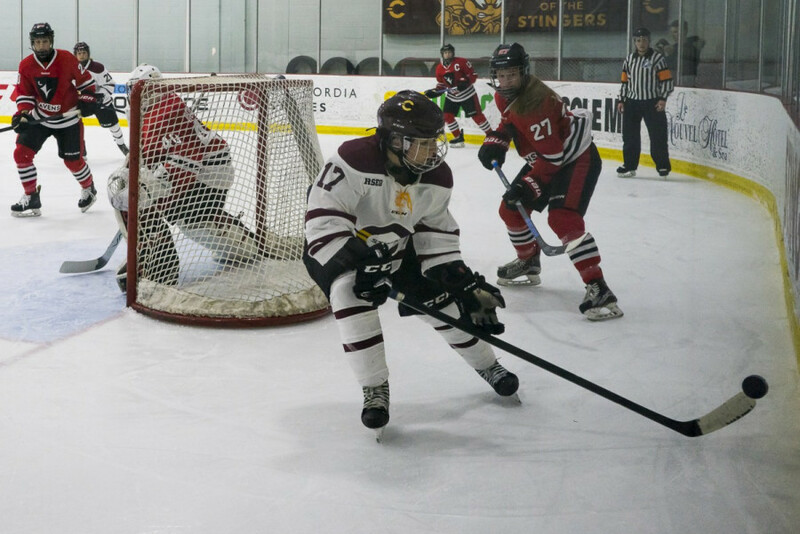 After the first 20 minutes, the Stingers dominated their opponents with 11 shots on goal to only four for Carleton. Katherine Purchase, the Stingers’ goaltender, had her first Réseau du sport étudiant du Québec start since sustaining an injury in the offseason. She made some vital saves on Carleton’s counter attacks, providing her teammates with the defensive confidence the team lacked against McGill. Coach Chu was satisfied with Purchase’s performance. Purchase stayed focused the entire game, and made breakaway saves in both the second and third periods. Goalkeeping is a solitary position on the ice, but Purchase had no lapse in attention. Melinda Prévost added another to the Stingers tally in the second. The Stingers had three power plays during the game. One in the second period, of which they did not manage to take advantage, and two other in the third. During the last period, the Stingers scored their two remaining goals on both power plays. Belzile added an assist to her point-count, allowing Lalancette to score her second goal of the game nine minutes into the third period. Amélie Lemay added one last layer of frosting on Concordia’s victory cake after 12 minutes of play in the final frame. The Ed Meagher Arena resonated with applause after the game, as the players greeted the crowd. Chu, happy with her team’s consistency during the game, hopes to see the same focus against Université de Montréal on Friday. Belzile shared her coach’s opinion. Central to the team’s discussion before the Carleton game was the use of screens on Carleton’s goalkeeper. The Stingers hope to put this strategy to use once more, as they face off against U de M on Friday Jan. 18 at CEPSUM.